Dude and Arnette built and replaced two existing fibreglass cowls on the oast house on our farm at Henden. Darren Hole carried out some detailed research to ensure that cowls of original design were installed. This was lovely work. The construction and installation went well and today they are in pride of place, enhancing the house itself. Thank you, Darren and your family and team. Much appreciated. 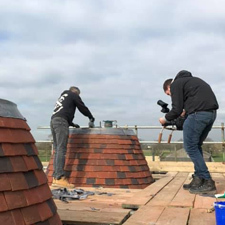 The guys from Channel 4 love a good oast cowl construction. Back in 2017 they featured us in their Village of the Year programme showcasing the history of oast cowls and Kent peg tiles. 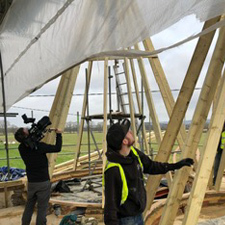 This time, they approached us to film the construction of an oast house a from start to finish. 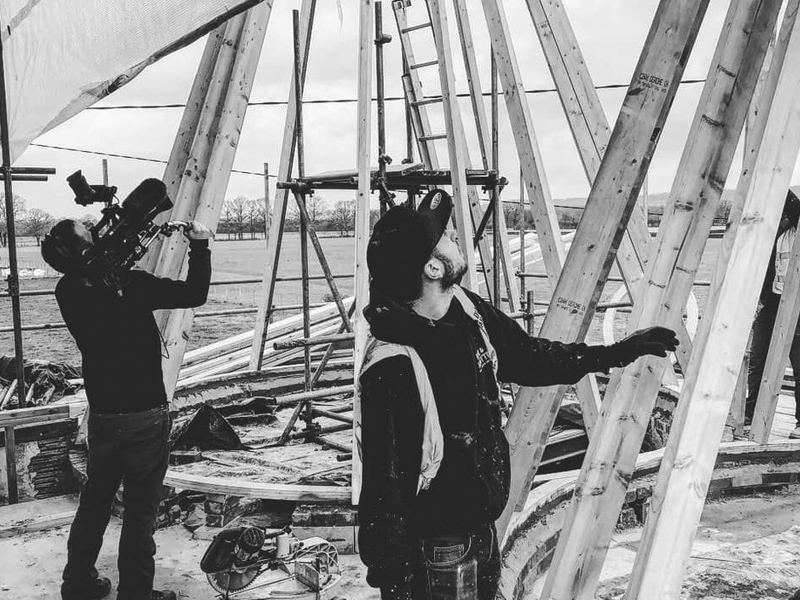 This is part of a programme that will showcase the build of different traditional buildings, each one being different and unique (a church, a windmill). With faces most definitely made for television, who were we to deny the public this experience? They were particularly interested in watching us build the two oast house roundels (the roof) and the two oast cowls. As highly trained craftsmen and a fourth-generation family business, we know this process very well. 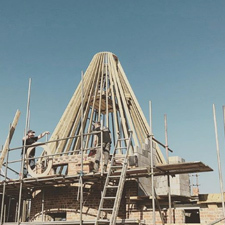 We restore and rebuild oast houses and oast cowls from scratch and over the years, we have worked on all types of oast houses across the country, including buildings listed with local heritage departments. We started the construction by pitching the two oast roofs known as roundels. We then used Tyvek (flash spun high-density polyethene fibres) to weather each kiln. After that, we used counter batten up each rafter, so that when we lathed the kiln it could hold the tile nails away from the Tyvek preventing holes. We then made onto the counter baton to work out where every row of tiles had to go so that they were evenly spread up the kiln and weathering one another. Going onto the makes we added the lath, which is wood that’s run out really thin and therefore gives us an opportunity to bend it and pin it around the roof. The lath also serves as a base for the tiles. We used tapered and square tiles as due to their shape they’re able to go around the roof without running downhill. Once the tiles were on with lead and fibreglass, the top was ready for the oast cowl. The last step of the process is to add the oast cowl on top, which we are in the process of putting on so watch this space for the final snaps! 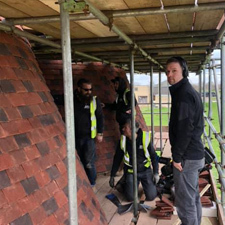 Whether you’re interested in oast construction, installation or kiln roof maintenance, get in touch with our specialist oast cowl build team for a clear, honest and concise quote and we will organise a visit to your oast house at a time that suits you. Want to see how we finish this project? Follow us on Instagram, Facebook or Twitter for the latest oast updates. After capping off our kiln and taking off the old cowl, we could see there was no saving it! Darren and his team did a fantastic job, capping off and then totally rebuilding our cowl, using wood and paint, which looks so much more alive than the old fibreglassed version. 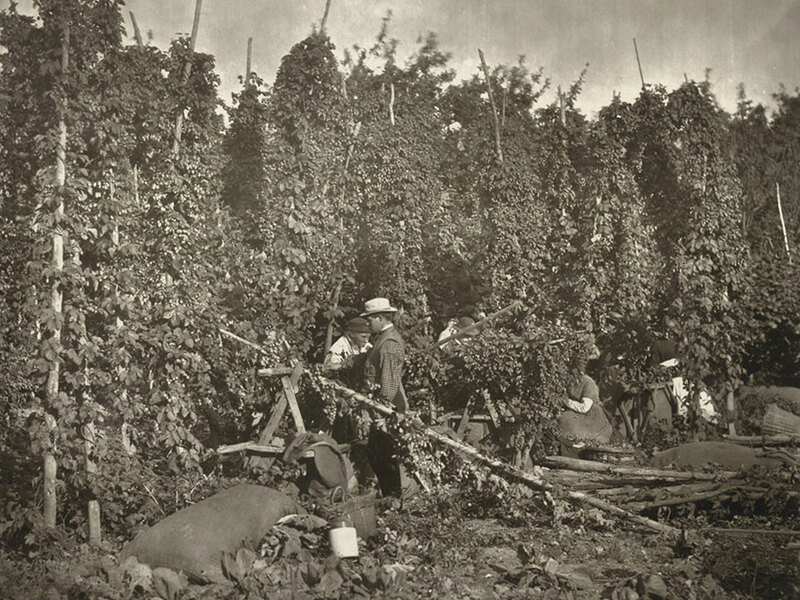 It is so nice to see a family business protecting a huge part of Kents heritage. Professional, quick and such a fantastically priced job. I would recommend Darren and his team to anyone. 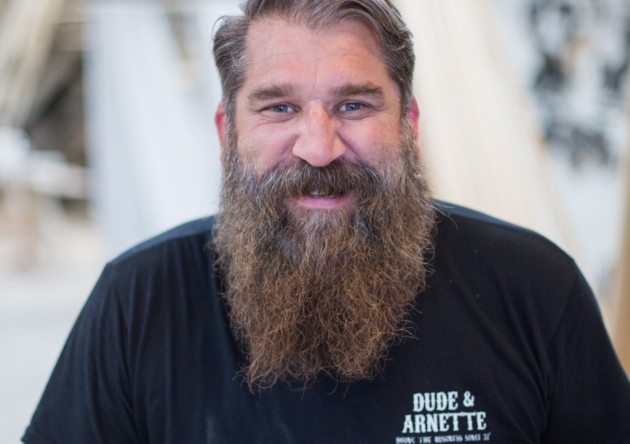 I am very happy to recommend Dude and Arnette. 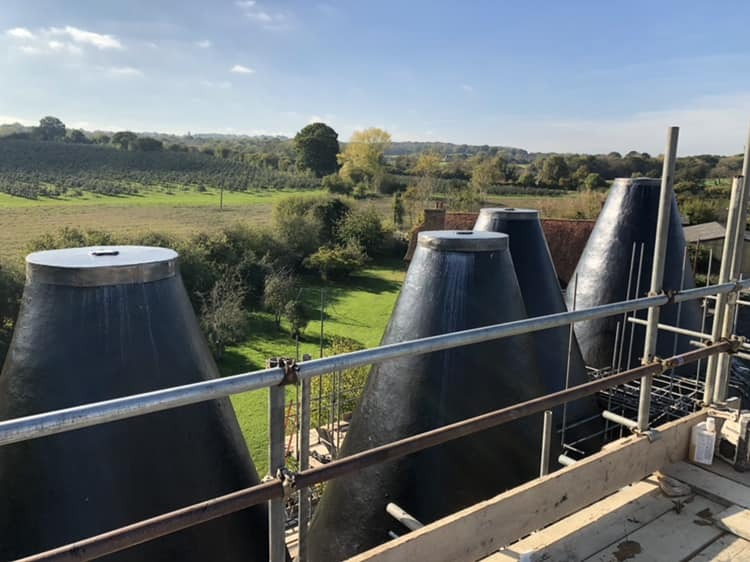 They dealt with the replacement of our oast cowls with great efficiency and expertise. The end result is magnificent. Our tenants were barely disturbed, and the price seemed very fair. Throughout they were a pleasure to deal with, and always prompt to answer queries. We’ve always worked with our hands here at Dude & Arnette, some of us used to be mechanics, some started working on oasts early raising cowls up by hand using pulleys and poles. We like getting stuck in, but there are lots of other reason why investing in a true craftsman for your oast cowl repairs is important. How often should I have my oast refurbished? Looking after your oast is important, it can preserve the life of your oast and save replacement. Oasts ideally should be refurbished every five to six years so any rotten or broken wood can be repaired before causing a larger problem. If we carried out the original repair work, it may be a little longer. From start to finish, a standard cowl refurbishment typically takes around four weeks. Why should I have my oast cowl repairs done by hand? Oast refurbishment is a detailed process. We carefully strip down the oast by sanding it – removing all the paint from the boards. This allows us to see any wear or water damage. The cowl then gets placed in a special drying room to remove any moisture from the wood before we begin repair work. Depending on the cowl’s condition, this may include meticulously replacing or repairing boards, heads, mainframe or curb, our expert craftsmen know exactly how to repair any problems with minimal disruption to the structure of the original cowl. A critical stage is the re-painting, we still paint the cowls by hand, the shape of the cowl means it’s almost impossible to get good, solid coverage by spraying. And we do five coats for optimum appearance and weatherproofing. Something we are committed to always doing by hand. We keep up to date with the very latest technology and quality when it comes to paint and wood treatment. Using cutting edge primer, undercoats and finishes leaves you fully weatherproofed and prevents any potentially costly problems developing with the wood- and iron-work. 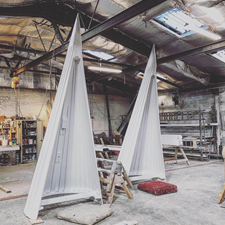 Make sure to follow us on Instagram or Facebook to see what we’re up to in the new year, or get in touch to chat about your oast refurbishment needs. It’s that time of year when those of us lucky enough to live in a period property are warming our feet by a large open fire. But period properties are hard work. Fact. They require tender, loving care, and a fair measure of expertise. 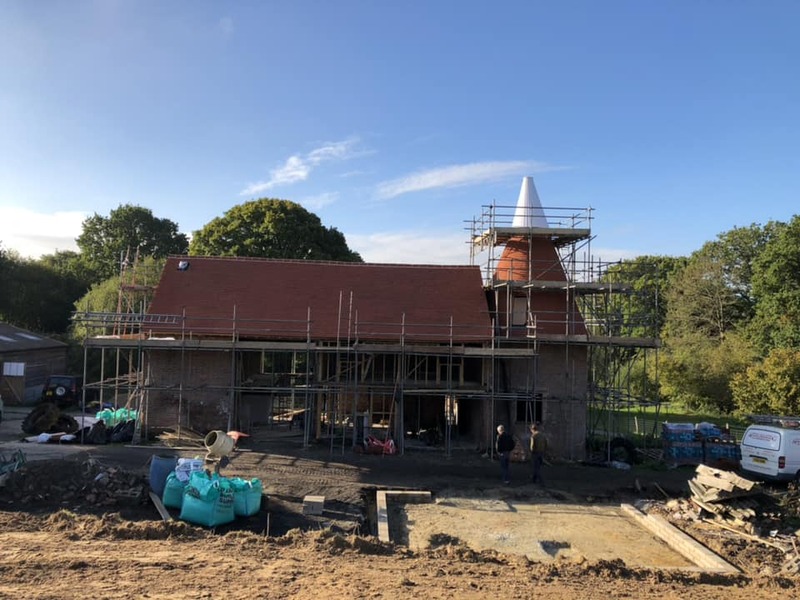 It takes bravery and commitment to take on an oast house restoration and we’re always inspired by the clients we work with. This month we spoke to Ecclesiastical and World Heritage Magazine about Richard and Jane Horobin’s project, two great examples of the bravery we admire. They transformed the Grade II listed Lydens Farmhouse, near Hever in Kent into a family home. And what a spot to work – with views over the High Weald Area of Outstanding Natural Beauty. What we liked about the Horobin’s was their commitment to preserving the historical features of the property. 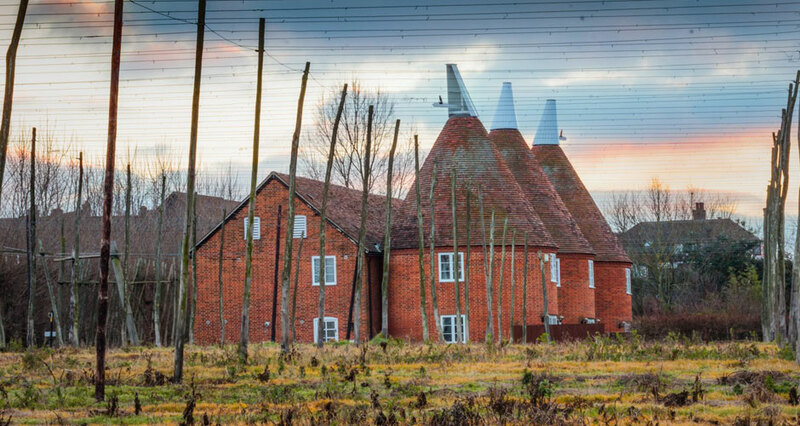 Which, luckily for us meant working with only the finest oast house experts in Kent! They meticulously used local joiners, bricklayers and other tradesmen when they could. For example, they used locally sourced oak to replace the original rotten timbers. And Tudor Roof Tiles (traditional clay Kent Peg tiles) that give an authentic, natural finish than modern tiles. The historical building had no record or clues of how it used to look. That’s where our generations of experience came in. From the diameter of the roundel base, we knew exactly the height and style of oast cowl to build to be true to Kent’s history. 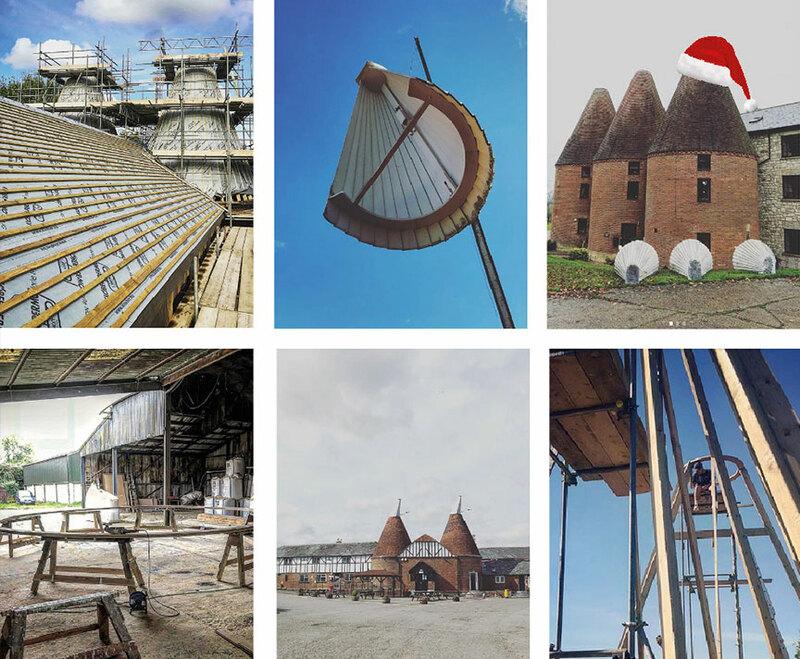 As the year draws to a close we’re so proud of our team and the oast house projects we’ve worked on across Kent, Herefordshire and Sussex. Thank you from us all for being amazing customers and we’re excited to working with you all in 2019. 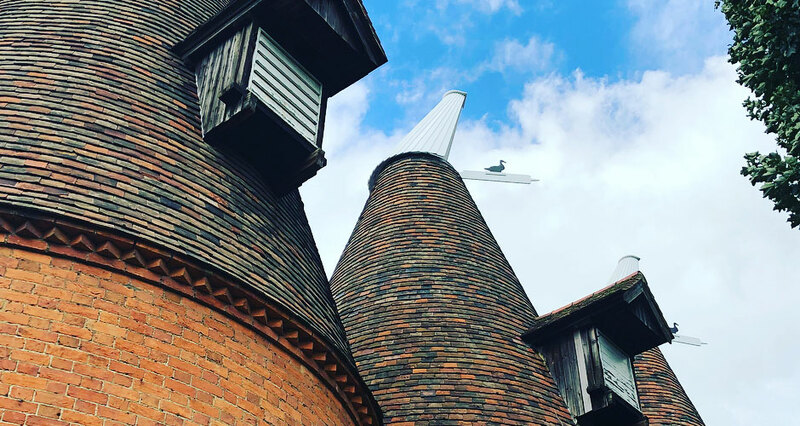 Make sure to follow us on Instagram or Facebook to see what we’re up to in the new year, or get in touch to chat about your oast restoration needs. We’ve had a wonderful summer here at Dude & Arnette, from press interviews celebrating craftsmanship to maintaining our much-loved oast cowl project Hop Farm and constructing brand new kiln roofs and oasts in Sussex. We couldn’t have done any of it without our hard-working team. Our very own Dude was also interviewed for Kent Life Magazine’s piece – 4 Kent Craftspeople: from blacksmith to woodcarver. It was an honour to feature alongside fellow traditional businesses including bespoke woodcarving, spinning, and a blacksmith. What we all have in common is a passion for bespoke work, attention to detail and respect for traditional tools and techniques. So thanks to Kent Life Magazine for showcasing true craftspeople like ourselves. 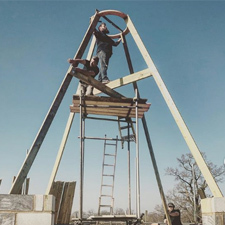 We’ve been on the ground on many sites doing not just restoration but complete oast cowl construction. We wanted to give you a look at the care, commitment and dedication to the craft you only get with a company with over 70 years of experience. You can follow us on Instagram or Facebook to watch us in action. See below some of the painstaking tasks of completing a new kiln roof, timber work, and the blacking phase. We’ve been lucky with the weather and have been enjoying some great views across the Sussex countryside. We were also featured in Ecclesiastical and Heritage World Magazine last month. 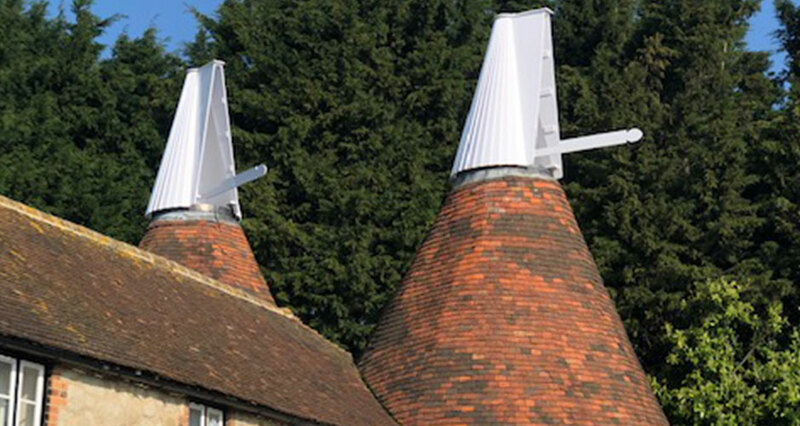 The oast cowl styles standing proudly atop traditional oast houses can be spotted across the Sussex, Kent and Hereford & Worcestershire countryside. Each county has a unique style that is stuck to and we love how these styles tell a story about our countryside’s history and are very much a part of our heritage, so we were delighted to be featured. 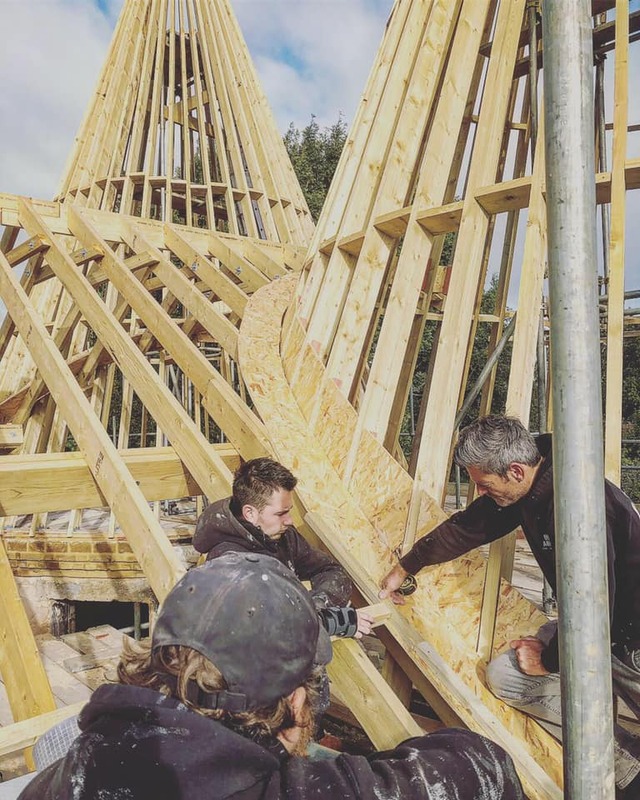 Autumn shows no signs of slowing down, but we work year-round and now’s the perfect time to prepare your roof and oast cowl for winter, so get in touch to chat about your needs. Having had storm damage to one of our two cowls I called Darren to ask his help and he came the next day and offered a verbal quote to remove the cowl, make safe and watertight. 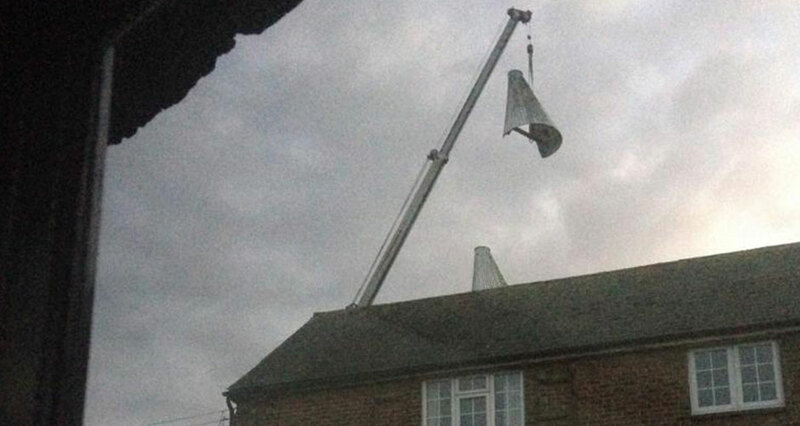 Two days later he arrived with his team and a crane and removed the cowls and took them away. I had mentioned to Darren that our daughter was getting married in 3weeks with the reception in the garden and even though he was very busy he got the cowls back up on the roof with a week to spare. I was impressed with their professionalism and quality of workmanship and would highly recommend Dude and Arnette.